a quilt block tutorial you cannot afford to miss! 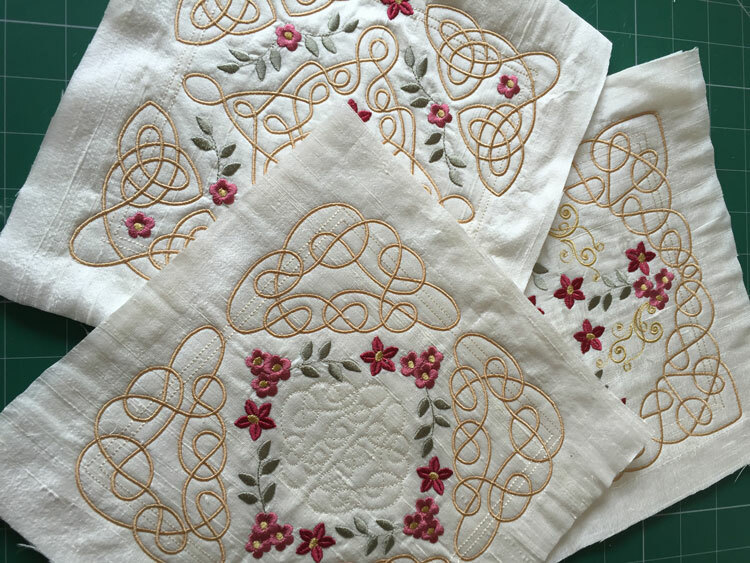 A few weeks ago I decided it was time to find out all there was to know about quilt blocks, embroidering them out and joining them for a beautiful completed project. I have been asked several times what the back of my quilt blocks look like, and in this tutorial you will find out how to embroider them out so they look just as good on the back as they do on the front….. 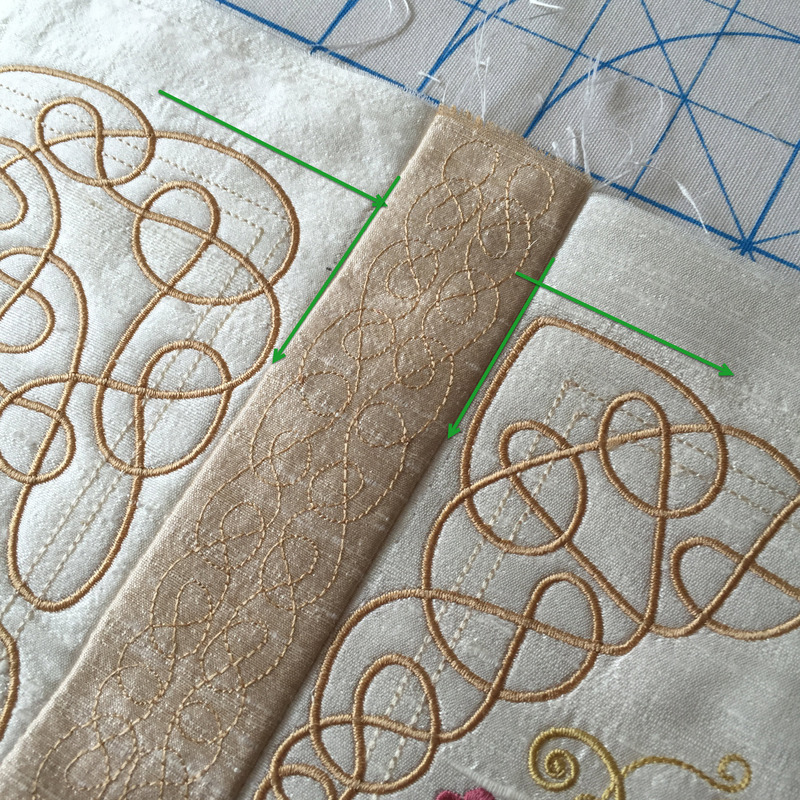 In the tutorial you will find out about the battings (called waddings in the UK) that are used in the quilt sandwich. I tested lots of them and share my results. These new blocks look good stitched out on silk dupion, my favourite fabric but the photo below shows the back! Lots of tips and advice on avoiding mistakes. It’s all here as I am keen that you do not make the mistakes that I made in learning how to get the best results. Be assured that I have “bad” embroidery days when things go hopelessly wrong. 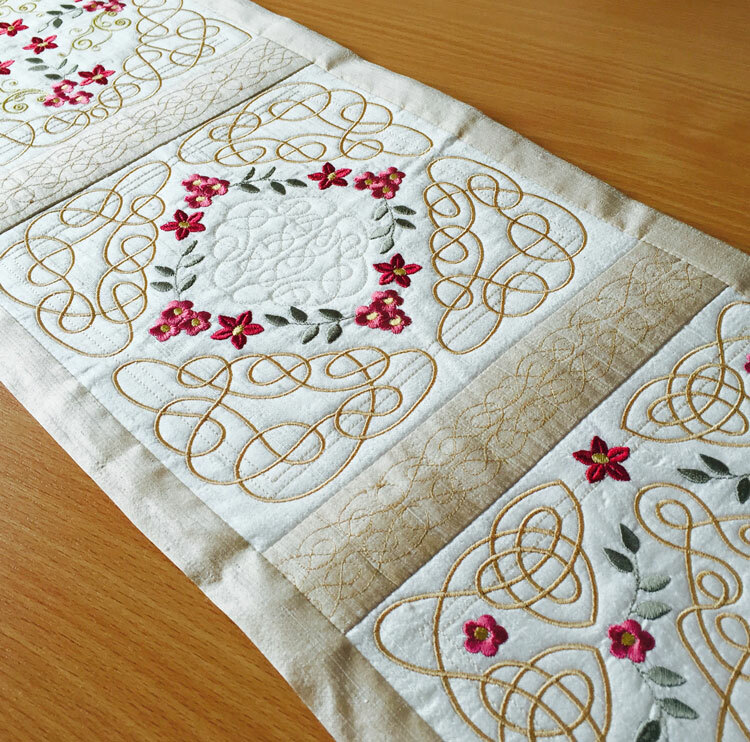 The main focus of the tutorial is analysing quilt blocks to get the best results and creating a table runner with the Celtic Grace Quilt blocks included in the tutorial. 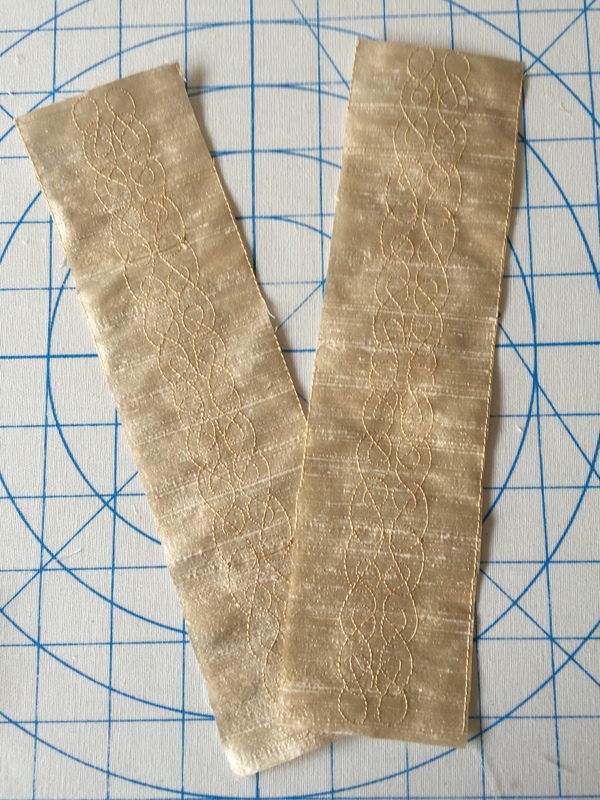 There are Celtic sashing designs too all ready to cut out, the perfect size for your 8″ blocks. 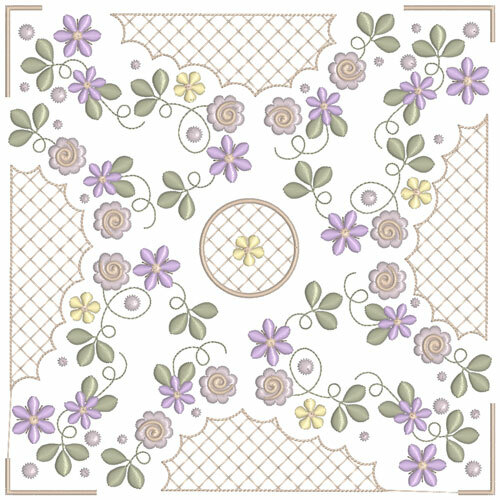 Check out all the wonderful new 260 mm wide Pamela’s Joy quilt blocks for your next project including a frame to make existing 200 mm blocks into 260 mm ones if you are fortunate to have these extra wide hoops! It’s all here and you will have the knowledge to quilt in the hoop and create stunningly beautiful quilts. The tutorial can be viewed and purchased here. 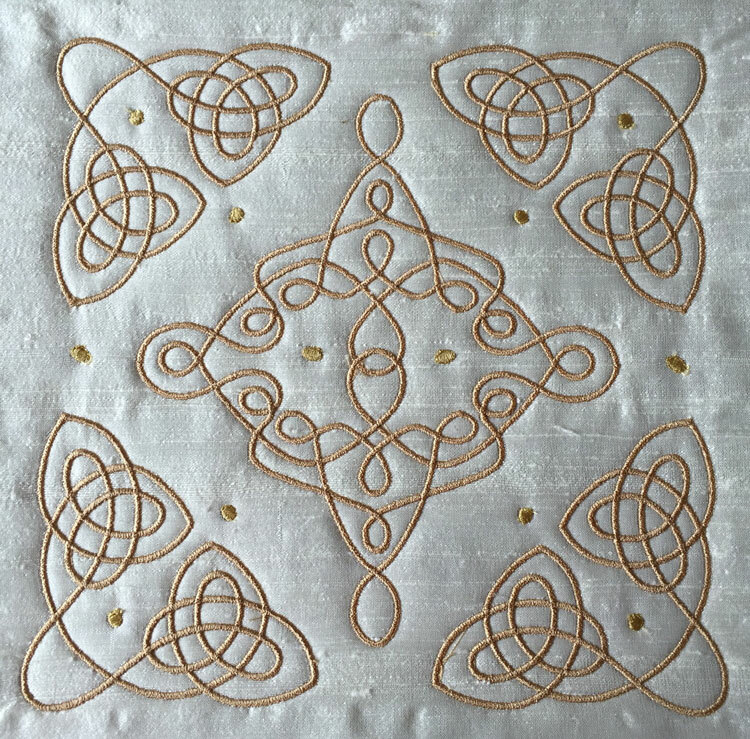 This entry was posted in Discussing machine embroidery, Embroidery projects, New Designs, Tutorials and tagged batting and wadding, Celtic Designs, embroidery on silk, quilt blocks. Bookmark the permalink. 16 Responses to a quilt block tutorial you cannot afford to miss! It is not a video but a PDF tutorial with over 48 pages of instructions with full colour photos. Hope that isn’t too disappointing. Does this tutorial apply to 6×6 blocks as well? Yes the principles can be applied to any size of quilt block. There are 3 Celtic Grace 5×5 blocks in the tutorial as well as the larger ones. That will make a beautiful quilt. I am looking forward to the video. It is not a video but a PDF tutorial with over 48 pages of instructions with full colour photos. does the tutorial explain how to sew the completed quilt block sandwiches together? Yes it does. I show you the method I prefer to use and the mistakes to avoid. I am very excited for this tutorial. Thank you! This looks wonderful. I am interested. Gorgeous…your work is always so inspiring. Looking forward to the tutorial. Its available now. I have just put the link at the end of the article so you can view it on the website.